The 48 colours of AKADEMIE® Oil color ensure brilliant results due to the many single-pigment colours, both directly used from the tube and as mixtures. 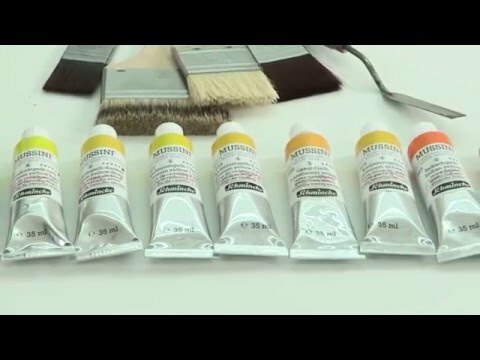 The balanced and educationally practical range offers opaque and transparent colours and, as a particular feature, four different shades of white for different purposes (for mixing with graded brightening and as underpainting white). Natural sunflower oil ensures optimal drying and a smooth consistency. All 48 colours are available in 60 ml tubes, 38 colours are also available in 200 ml tubes. Titanium white is also available in 500 ml jars and in 5 l buckets, other colours in buckets on request. All AKADEMIE® Oil color shades can be mixed and combined with all other Schmincke oil colours (MUSSINI®, Norma® Professional, College® Oil) and the extensive oil mediums.